The other day while going through the CVS drive-thru to pick up a prescription for my daughter, I thought the coast was clear. I did not see any cars in front of me, which mean zero wait time. This is surely a welcome sight at the end of a long workday! As I turned the corner to make my way to the drive-thru window, I noticed an elderly lady and her dog leaning against the wall (actual pic posted here). This couldn’t be! I thought the CVS drive-thru window was made for automobiles. A person on foot must certainly be required to enter the store, and make the long walk to the pharmacy, which is strategically located in the back. How much room do we give a pedestrian? I had no choice but to wait for the lady to complete her prescription transaction. I put the car in the Park position, and soon realized that I was giving her the same spacing I would give a car or truck. Was this appropriate? Given she is on foot at a drive-thru, do I give her more room? Less room? If my foot were to slip from the brake pedal, the potential for injury to the women and her dog is significant, especially since they are not protected. Would I be legally liable if an accident were to occur? What was her liability for using this convenient service intended for automobiles? With my luck, the jury would likely have several pet-friendly folks, and little sympathy would be shown to me. What role did the dog have in this situation? To my knowledge, individuals can take dog into stores if they have a medical reason. I don’t think it was a seeing-eye dog because, while she waited, she was reading a drug form handed to her by the pharmacist. Was she too embarrassed to take the dog into CVS? It’s possible she did not want to cause a scene or make things uncomfortable to other patrons? I’m also curious whether she had to wait behind another customer who was on four wheels? Did she assume that since cars have four wheels she could take her four-legged animal? 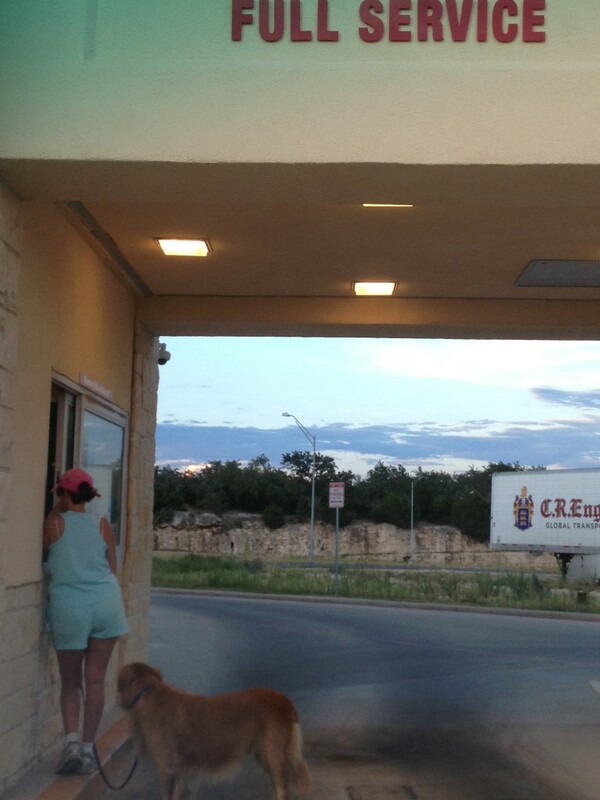 I’m confused how she made the determination that she could walk-thru the drive-thru service. The more I think about this situation, it’s likely I’m making a big deal out of it. She has the right to approach the drive-thru window in a car, a motorcycle, and even a tricycle! What’s next, though? What if she was on horseback? Would the pharmacist alter the prescription to something that would help her mental stability? I don’t know, and perhaps will never find out. When it was finally my turn, the order was processed, and I drove away … because that’s what people do when they go through a drive-thru! As I drove home, I saw the lady with her dog in tow. She appeared happy and relaxed, which confused me even more.